With Tyus Battle on the bench due to what would be diagnosed after the game as a lower back bruise and Paschal Chukwu joining him on the sideline with four fouls, Syracuse had to dig deep on defense. 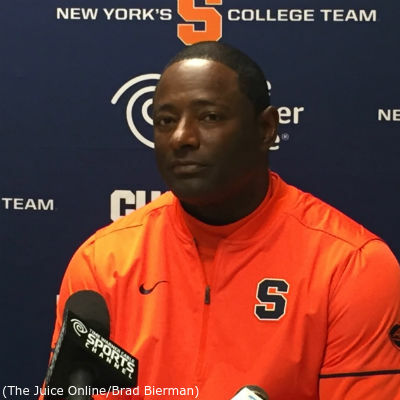 The extra effort paid off as the Orange (5-0) held Toledo (3-1) to one field goal over an 11:43 span, then held off the Rockets late to secure a 72-64 win in Hoophall Miami Invitational at the Carrier Dome. Without the team’s top scorer in Battle, the team needed to patch together some offense and Frank Howard led the way. After his backcourt mate tumbled to the hardwood after falling for a shot fake and eventually could not continue, Howard scored 11 of his career-high 25 points in the final 16 minutes of the game. SU needed almost all of those points due to the Rockets’ hot shooting from deep. Toledo hit a dozen three-pointers on the night, but leaned on their perimeter shooting because they could get almost nothing done inside the arc. Syracuse allowed the guests to make only 4-of-29 (13.8 percent) of their two-point field goals. The Orange also beat up Toledo on the glass, owning a 50-31 rebounding advantage. SU hauled in 16 offensive rebounds in the game collectively and converted them into 22 second chance points. Tyus Battle and Frank Howard powered the Syracuse offense for most of the first half, doing so mostly with an array of perimeter jumpers. The two were responsible for a modest streak of six straight points that gave the Orange their first meaningful lead. Howard was fouled on a pull-up, but buried both foul shots to push the SU lead to three. A couple minutes later, Battle struck for a mid-range jumper, then Howard came off a screen on the next trip down to stick a jumper off a screen for a 15-8 Orange lead just over eight minutes into the game. The two starting guards actually combined for 18 of the team’s first 21 points before ceding the offense to a different pair of teammates. Geno Thorpe was the first part of the new duo, using a backcourt cut to get free on the baseline for a nice bounce pass from Bourama Sidibe that became a lay-in. 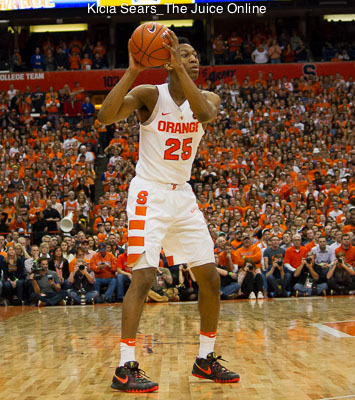 Thorpe’s score stretched the Syracuse lead to 23-15, the biggest gap of the opening half. 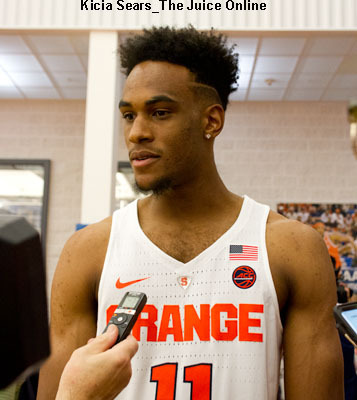 After the four-minute mark passed, Oshae Brissett took over, scoring seven straight points for the Orange. Brissett made his mark in several ways, first draining a three-pointer, then finishing through contact inside. With under two minutes left in the half, Brissett was fouled on a drive and knocked down both charity shots to keep SU in front by seven. Toledo got a pair of threes to slice the margin to a single point, but Howard drove and zipped a pass to Thorpe, who connected on a three of his own to make the Syracuse lead four. The Rockets responded with their fourth triple in the final 2:04 of the half to clip the Orange lead to 33-32 at the break. Toledo added a three coming out of the locker room to take their only lead of the night, but Matthew Moyer grabbed the lead back for SU on a three-point-play. Moyer’s putback and foul shot also triggered a streak of 11 straight points. Howard knocked down a pull-up jumper while coming off a screen, then Moyer electrified the Carrier Dome crowd by swooping in from the weakside and hammering a Battle miss home with a two-handed slam. Moyer then fed Howard off a steal for a lay-up and a 42-35 lead. The Rockets’ next possession was where Battle hurt his back. Battle leaped at a Toledo shooter, but made contact on what turned out to be just a fake and tumbled over, landing with a resounding thud on the Carrier Dome floor. Battle eventually walked off during the ensuing timeout and tried to play through the injury, but only lasted a couple minutes before signaling the bench he could no longer play. Shortly after Battle’s injury, Howard would finish the SU run with a jumper from the right elbow, giving them a 44-35 lead five minutes into the second half. Toledo narrowed the margin to three points, but Syracuse responded with eight points to start a 13-2 run. In just over a minute of play, Brissett and Howard drilled three-pointers around a pair of Howard free throws. The quick points gave the Orange their first double-digit lead of the game. The Rockets stopped the bleeding with a pair of free throws, but Sidibe got SU back in the scoring column with a step-through and left-handed finish. Three possessions later, Brissett finished a beautiful drive while being fouled and added the charity shot for a 57-43 lead with just over eight minutes on the clock. Toledo got the lead down to nine points in short notice, but the trey that bounced through the hoop was their first field goal in almost six-and-a-half minutes and they would not add another shot from the floor in over another five. Syracuse’s strong defense during this span would keep the Rockets at arm’s length, as the lead alternated between nine and 11 points until Howard tossed a no-look lob to Moyer for an alley-oop that pushed the Orange lead to 66-54 with 1:44 to play. Howard would nudge the lead out to 13 points on Howard’s driving lay-up with 38 seconds to play, but Toledo would not go away. The Rockets got a jumper and forced a quick turnover, which they converted into a pair of free throws. SU gave the ball away once more and the guests struck for three to make it a 70-64 game with 17 seconds to go. Syracuse inbounded the ball and Marek Dolezaj tossed a long lead pass to Moyer, who threw down a two-handed dunk for the final nail in the coffin. Frank Howard controlled the action for the Orange, playing a turnover-free game while burying mid-range jumper after mid-range jumper as he piled up 25 points. Oshae Brissett posted personal bests in both scoring and rebounding as he logged a 17-point, 14-rebound double-double. Matthew Moyer also had his best game of the season, adding 11 points. Tre’Shaun Fletcher led the way for Toledo, burying 5-of-6 threes for most of his 19 points and also grabbing 11 rebounds. Nate Navigato and Jaelan Sanford both hit three triples as they had 13 and 11 points, respectively. Luke Knapke contributed a dozen points to the Rockets’ cause. The Orange are off until Monday, which will allow Tyus Battle to rest his back for several days before Maryland pays a visit in the Big Ten-ACC Challenge. The Terrapins stand 5-0 on the season, headlined by a 79-65 win over Butler, and host Saint Bonaventure on Friday night before their first road game of the season at Syracuse. Maryland features a half dozen players averaging at least eight points per game on the season, led by Anthony Cowan’s 14.6 points per game. Kevin Huerter (12.4 points per game) and Bruno Fernando (11.2 points per game) are the other Terps averaging double figures in scoring. ESPN2 will televise the Syracuse-Maryland game, which kicks off the Big Ten-ACC Challenge. Tip-off is set for 7:00pm Eastern and the game can also be watched online at ESPN3.com.